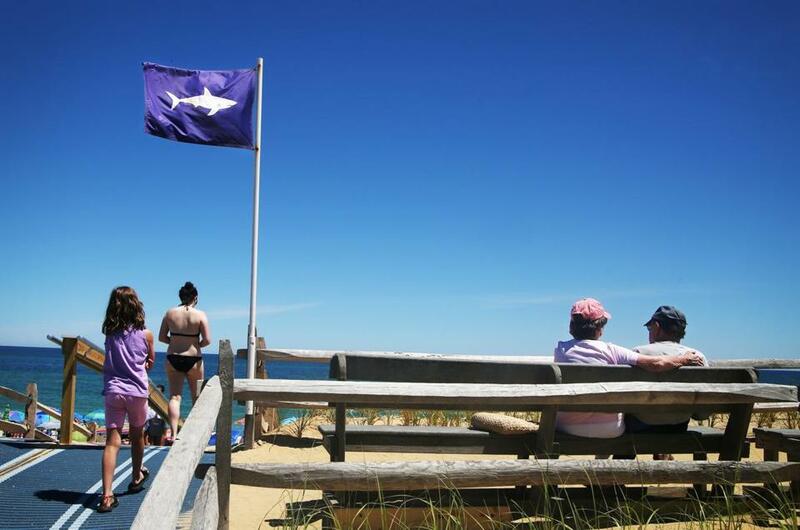 A flag warned beachgoeser of sharks at Nauset Beach last month. Waters at Head of the Meadow Beach in Truro and Nauset Beach in Orleans were closed Monday to swimmers after sharks were spotted swimming along the coast, officials said. Head of the Meadow lifeguards saw a shark jump out of the water just 100 yards from shore, officials from the Cape Cod National Seashore said, leading to the beach’s closure around 11:39 a.m.
Nauset Beach was closed around 10:20 a.m. for an hour, but has been reopened to the public, said Cynthia Wigren, CEO of the nonprofit organization Atlantic White Shark Conservancy. Several other sharks have been spotted Monday swimming in Cape Cod waters, but none have swam close enough to shore to pose any threats to swimmers. There have been seven shark sightings along the Cape just Monday morning, the conservancy reported.